A 45-Year-old man who was spectating Jallikattu dies of heart attack. 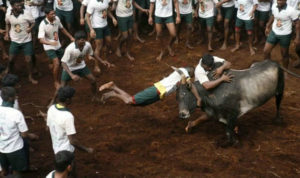 In addition to that, more than 40 bull tamers were also injured. This was all part of the Pongal Festivities that are being held in Tamil Nadu. At Alanganallur (a venue for Jallikattu) a 45-year-old man died of heart attack, he was in the spectator’s gallery, also 40 bull tamers were severely injured, the police said. 729 bulls were used in Jallikattu, an event that is well known and is watched by tourists from around the world. A border police team and 1500 policemen were deployed in the Jallikattu event, the police say they did this to enhance safety measures in the area. RP Udhayakumar who is a Minister in Tamil Nadu started off the Jallikattu event by releasing a bull from its pen. On Thursday, RP Udhayakumar unveiled a memorial slab at Alanganallur for Jallikattu. Gifts and prizes were given to those people who successfully tamed the bulls, and to those bull owners whose bulls were not tamed. The Jallikattu events were held at 4 locations in the state, which includes Dindigul, Pudukottai, Avarangadu in Tiruchirappalli and Karur. Sporting Events likes bullock cart rallies were held in other villages. To keep the tradition, bulls are sent through the Vaadi Vasal, which is the entrance of the sporting arena, this is part of the prayers for prosperity and good harvest. As part of the Pongal Celebration, several events focused on folk arts and rural sports, they were held by the Tamil Nadu’s tourism department. Jallikattu was banned by the Supreme Court in May 2014, and in 2017 the Tamil Nadu introduced a new ordinance that will help facilitate the tradition, this was done due to the heavy protest being held in the Tamil Nadu state. Jallikattu was held in secret places during the year it was banned, bull taming took place in the 3rd week and 1st week of February in 2014.